A screen lock passcode is a good security measure. If you forget this passcode, One last-resort solution to this is resetting your device which deletes all your data and reverts the device to factory settings. 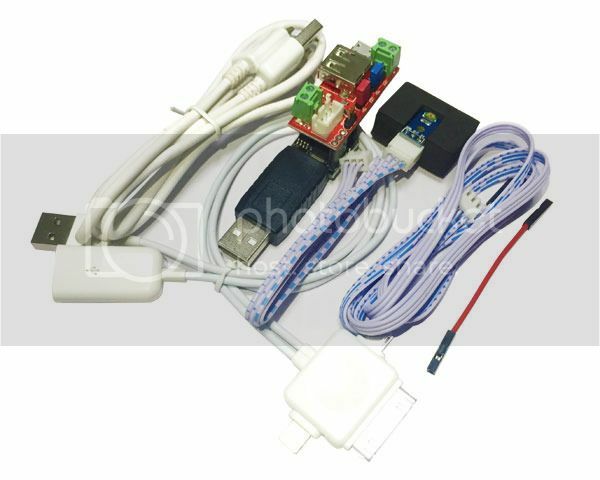 MFC Dongle allows you to get user password on iPhone 4, 4s, 5, 5c, 5s, 6, 6S, 6 Plus & 6S Plus and HTC / Samsung Android mobile phones (V4.3+). MFC Dongle does not require resetting your device which entails deleting data and reverts the device to factory settings. MFC Dongle keeps your device's data and allows to get the passcode easily. Support iDevice iCloud (iPR) access Data details recovery, The iPR function only working with an accessible iDevice (Meaning that you can access information on the device which is operational etc.) jailbreak on iDevice is not required. 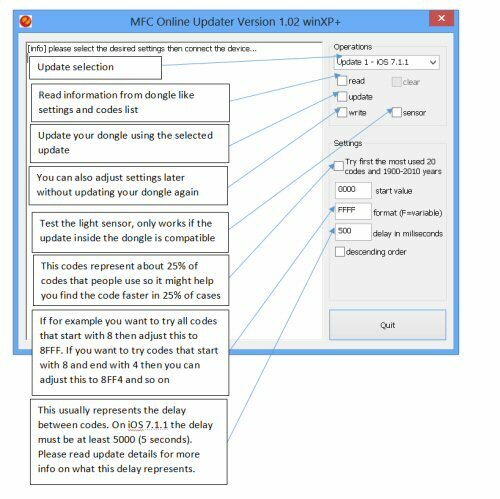 iWatch Flash by MFC under windows Almost done, and we will release new cable for iwatch soon. this is the first in the world solution. About 40 seconds / 5 codes (22 hours to try all codes) in some mobile phones the delay between codes will increase up to 10 seconds with more wrong codes so delay between codes must be around 10000ms(10seconds) so the waiting time will be 44 hours not 22. You must adjust the delay accordingly. If you get the message accessory not supported just press ok. Another message might also appear after first minute so you need to press ok to that too otherwise you might miss some codes during the time the message is displayed. You can now connect the MFC dongle to computer and click read button. This will be request for Version 1.0.3 or new version. This update will automatically try to find the code and require no user intervention. Just connect MFC dongle to phone and unlocking will start. The light sensor must be connected in such a way that after unlocking is done the light sensor will detect more like that initially detected. Usually this can be achieved if the light sensor is placed in the left top corner, where the message icon will be displayed after unlock. The delay must be at least 4500 for correct function. This update will help you unlock your phone code even if the phone is disabled after too many tries. The default delay for this update is about 4300 ms (4.3 seconds). Update your MFC dongle using this update and connect the light sensor on the top right side of the iPhone screen. Go to the phone disable screen and connect MFC dongle to phone and wait 5 seconds. Swipe with your finger to go to Emergency calling. The MFC dongle will automatically detect the swipe and try the next available code. Then the phone will automatically come back to the phone lock screen. To continue swipe again to the emergency screen and so on until your phone is unlocked.